Dalit voters of MP’s Mhow are in a quandary: To vote for BJP, which has ‘done nothing in the last 15 years’, or Congress, ‘which did nothing before’. 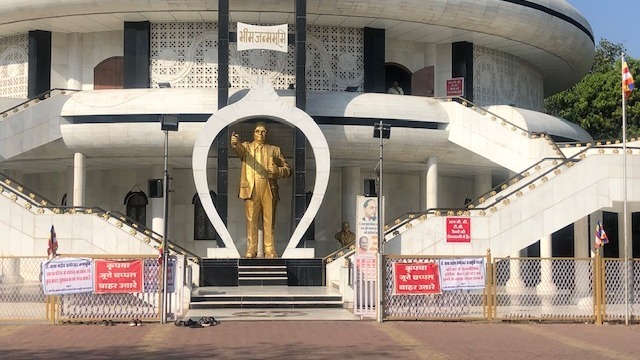 Mhow, Madhya Pradesh: Dr Ambedkar Nagar — formerly and more commonly known as Mhow — was once a quiet cantonment town in Indore district. But in recent times, it has become an ostentatious platform for Dalit politics, and the centre of Dalit political symbolism. Top politicians — from Prime Minister Narendra Modi to Madhya Pradesh chief minister Shivraj Singh Chouhan, former Uttar Pradesh CM Mayawati to Congress president Rahul Gandhi — flock here to espouse the Dalit cause. And why? Because India’s foremost Dalit icon, Dr B.R. Ambedkar, was born here in 1891. Yet, the plight of the Dalit voters of Mhow reveals that all these political visits are just symbolism, nothing else. Voters are in a dilemma on whether to back the BJP, which they say has done nothing for them in the last 15 years, or the Congress, which they claim did nothing before that. As per the 2011 census, Dalits constitute around 15.2 per cent of Madhya Pradesh’s population. And with BJP trying to win a fourth term, the Congress trying to dislodge it, and Mayawati’s Bahujan Samaj Party hoping to make a mark, the Dalit vote is crucial to all. Kaaji Ki Chaal is a congested, garbage-filled settlement filled to the brim with flies and puddles. Cynical voters of the settlement say they themselves have to live like ‘keedas’ (insects), and that neither the ruling BJP nor the Congress has done anything to make their lives better. “Neta yahan se kuchh hi kilometre door badi Ambedkarji ki murti pe aate hai, yeh dikhane ko ki woh Dalit ke saath hain. Aur hum yahan gandi naali ke keede jaise jeete rehte hai (Politicians come to the grand Ambedkar statue a couple of kilometres away to show they care about Dalits. But we continue to live here like insects in dirty drains),” says an agitated Suman Kaushal. “We have no drainage system, no cleanliness and no proper drinking water. We don’t have any lights on the streets. Earlier, we had to relieve ourselves in the open, but being Dalits, people pelted stones at us. The road leading to Kaushal’s basti is full of unauthorised settlements dominated by Dalits, and the inhabitants live under constant fear of their colonies being razed. Politicians, they say, have done nothing to help them secure proper housing, which is tantamount to a denial of their basic rights. While some say the Chouhan government’s initiatives like cheap ration, slashed electricity prices, toilet construction and gas connections have brought some relief to members of the community, others say their living conditions continue to remain pitiable. Ravi Jadhav of Kaaji Ki Chaal, who works as halwai (confectioner), says: “With so many big politicians visiting the Ambedkar statue, it has benefitted the rest of Mhow, except our settlements. Nobody has done anything for Dalits, even though they visit Mhow in Ambedkarji’s name. Some, however, are in favour of bringing the Congress to power, hoping it would be less apathetic than the BJP dispensation. Some of Wakode’s neighbours nod in agreement; others look unsure. But despite all this, it seems to be a straight BJP-Congress electoral scrap — there is little enthusiasm for the BSP here. The party has an influence mainly in the Gwalior-Chambal and Rewa regions of the state, but not among the cynical, suffering Dalits of Mhow. Ibnsuleman’s views are appreciated. Who will tell those leaders? Great selfishness at the cost of dalit / muslim voters. Don’t understand how to to unite the leaders? Why did never told about the massecree and the peak of human rights violation by extremist in Gandhiji’s Gujrat.